I help you move through whatever is blocking you—internally or externally—so that you grow both on and off the page, and develop your strongest voice and vision for your work (and for your life). I specialize in creative nonfiction, memoir and poetry, though I occasionally also work with fiction writers, and I work with seasoned, professional writers and with beginners, and everyone in between. Whether you are writing a book or exploring the place of writing in your life, I can work with you to design a program that suits your particular needs, one that holds you accountable, helps you get clear on your ideas and put them on the page, helps you integrate your writing into your life, and guides you in the revision and the publishing processes, and more. My coaching brings together mindful attention and aspects of craft; product and process; the head and the heart; the mind and spirit. My abilities and credentials as a coach are unique. I have first hand creative writing experience, an academic background, and the qualifications of a professional editor, all of which allow me to provide the highest quality editorial and technical advice to writers. At the same time, I have a deeply spiritual orientation and bring to my writing coaching my intuitive wisdom and experience as a transformational coach, meditation practitioner and yoga teacher. Indeed, for me, writing is neither only product nor process, but something greater than the sum of the parts: it is a means of discovering, actualizing and sharing our voices—perhaps our most precious, powerful resource—with ourselves and with the world. Working with me, my clients find that they are able to go deeper into their writing, discover more about themselves and the world, and communicate more effectively and powerfully with others. While a class can provide community, one-on-one coaching with me can be a much faster, more efficient and deeper process of working on a writing project than a class. My coaching is always finely tuned to each client’s individual needs and interests, and I work with clients to give them the tools and guidance so that writing becomes an integral and coherent part of an aligned life. There are a few ways we can work together. 90 minute session in which we talk about your plans/goals as a writer and look specifically at some of your pieces for editorial and emotional support and a clear path forward. Price for First Time Session with me. In these sessions, I will work closely with you to help sculpt a writing program in order to keep you on track, give you some techniques for accessing different aspects of your creative self, and workshop your writing through close readings and editing sessions. Each session includes my reading up to 8 pages of your writing and a 45-minute conversation. This is highly personalized writing coaching, one that exceeds the attention given to students in full graduate programs. This is great value for your money, and a great program to jump-start and deepen your creative alignment. By the end of these sessions you will have a solid body of work that you are proud of, a more aligned, coherent relationship to writing in your life, and a clear direction forward. Do you have a stack of work in your drawers or on your computer that you don’t know what to do with? Does the mess weigh on you? It’s easiest to create new work if you know what you’ve done already and have some order to that work. This six month program helps you establish a secure writing practice best suited to your individual life. We will have bi-weekly check-ins to establish a solid new habit in your life, get rid of old habits that aren’t working, and clear your way for a more productive, fulfilled, aligned future. This package consists of twelve meetings and feedback on student work in each session. Students will email up to eight pages per session three days in advance (additional pages can be included for a modest fee). Clients will get both editorial feedback, and coaching about the process itself, and the ways in which we can learn from our own creative activity. Sessions will be 45 minutes each and, when needed, will include email support on the weeks a session is not scheduled. This three month program helps you move forward in a tangible and efficient way with a writing project. Are you just starting a project and not sure how to begin? Are you stuck in the middle and need some guidance? In this program, we’ll have bi-weekly meetings to discuss your project and its development. We will discuss both editorial aspects and the process of writing, what’s getting in your way and where you want to go, the big ideas and what’s happening on the page. Each session, I’ll give you very clear assignment to move forward with your project for the next week so that you have a clear direction and accountability. On the weeks we’re not meeting in person, you’ll send me your writing (up to 15 pages) and I’ll read it, make comments and give you an assignment for the following week, when we’ll meet again either in person or in a recorded video session over zoom. This package consists of one 90 minute meeting and five 60 minute meetings and six email/editorial check ins. It also includes email support when you need it, if you’re stuck or have a question. In this package, I’m coming along side you and holding your project with you so you see real movement with it! Clients have told me that they feel like they made years of progress in just three months! What’s holding you back from completing your project? Where does your project need fine tuning? Stuck and need some feedback? I will help you effectively move through internal and external obstacles so that you create your finest work. In this package, we will work together to create a realistic timeline to meet specific goals. Once outlined, your goals will be met with me as your coach; whether you want to write a chapter, complete a first draft, or finish a final draft, we will work together to break it into manageable segments and make sure the work gets done. Over the course of our work together, I will provide the very highest quality editorial coaching, and the spiritual and emotional coaching you need to follow through on your projects and make them align with your greater life purpose. Students complete this package with a great sense of accomplishment, fulfillment and energy. Do you have a manuscript that you want to perfect so that you can send it out for publication? Have you worked so long on a manuscript that you have lost your perspective and vision? Do you need a keen eye, a skilled editor, and in intuitive reader who can give you the tools you need to edit and present your most accomplished work? I help clients with overall structuring, filling in holes, understanding the narrative arc and honing stylistic aspects so that your manuscript is in its best possible shape, and your voice and vision come across clearly and compellingly. Many of my students have published books and articles after working with me. contact me to talk about your project and for prices. I will walk with you through every step of writing your book, from the initial conception through the final, polished draft. I offer both emotional and spiritual support and expert editorial support. I can help with both the ephemeral and the practical–from setting up a regular writing practice to writing your best book proposal or most powerful final draft. contact me to discuss and for prices depending on your unique project. Working with Nadia helped me get much needed footing during a critical turning point in the creative process of writing my book, Generative Scribing. I first reached out to her seeking a coach with a sensitivity to a first-time author, a solid practice in mindfulness, and writing chops. With all her facets and talents, Nadia definitely covered these three. I was able to shift an abstract assemblage of written-down experiences into a coherently expressed body of knowledge. Her expert guidance through this process was key, and I’d highly recommend her services. I had written several poems over the years that seemed to suggest a project. I took a memoir workshop that helped me confirm its viability. But I was stuck. Was this a memoir? A poetic memoir? A story in poems? What was its shape? What did I know about the time, place, and people in this story and what did I not know? Would anyone want to read this? Why does that matter? These questions and more were burbling up as Nadia and I met regularly and as my work came into focus. I was drawn to working with Nadia because not only is she a writer and teacher, but she is also a yogi with a spiritual practice. Her guidance led me to a door through which my own writing and clarity about my project was waiting. Nadia’s approach is about consciousness and compassion, including self-compassion. 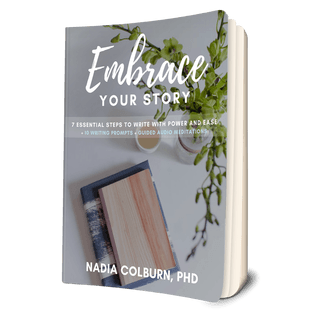 For my creativity to flourish and my writing to flow, I need to stay tethered to these concepts, which Nadia helped me do. Working with Nadia makes me love both the process and the product! Nadia has supported my staying focused and provided excellent editorial input so that there is, in fact, a great product: a completed chapbook and a larger manuscript close to completion, two things that I couldn’t quite imagine at the beginning of my work with Nadia!